The micro-finance industry is witnessing a high growth since financial inclusion program has been launched by the Reserve Bank of India (RBI) along with Central Government. Further, micro-finance business really supports people with financial help where the formal banking system is not available. What is a Microfinance business? Small businesses and house woman don’t get the loan from the banks due to lack of proper facilities and documentation. To help them in the funding, various people often fund these business and house women in the small amount, usually less than Rs.50,000. This small funding is known as Micro finance business. 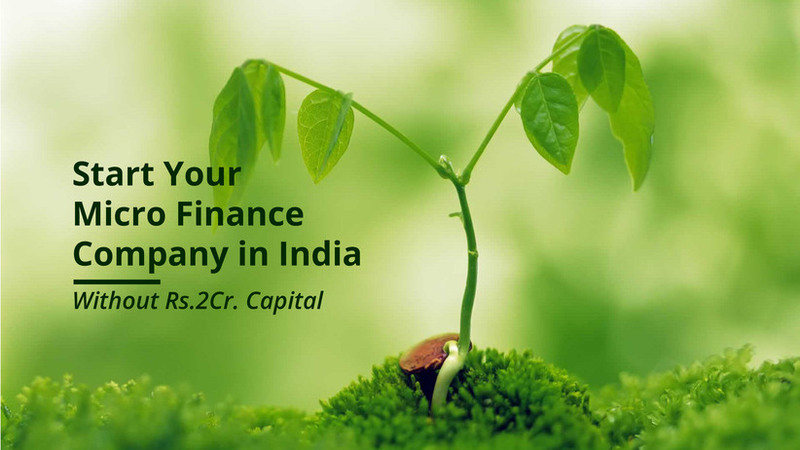 In India, ideally, any finance business is authorised only to Non-Banking Finance Companies (NBFC). However, some business forms have been given exemption by the Reserve Bank of India (RBI) to do finance activities up to a certain extent. In this article, we shall discuss only about the Micro Finance business. The two most ideal forms of business can run Micro Finance Institutions (MFI). 1. Non-Banking Finance Company (NBFC): A company registered with RBI with a motive to run a microfinance institution is known as NBFC –MFI. Further, people generally believe that any NBFC is authorised to take deposits as well. However, the same is not true. All NBFC are not authorised to take deposits from the general people. Further, if any NBFC needs deposits, then it needs to get a separate status from the Reserve Bank of India (RBI). To get the deposit taking status, a separate application needs to be filed with the Reserve Bank of India (RBI). The procedure to register micro finance company as NBFC is little complex and costly. As per RBI, NBFC shall be registered only with the minimum net owned funds of Rs.2 Cr. This is the very basic requirement. Raise Authorised and paid up capital to Rs.2 cr. Deposit Rs.2 cr. In fixed deposits and obtain a certificate. Get all the certified copies and complete the other RBI formalities. Wait and coordinate with the Reserve Bank of India (RBI) for further instructions. Learn more about the Micro Finance Registration as an NBFC COMPANY. 2. MicroFinance Business through Section 8 Company: This is perhaps the cheapest way to register a Micro Finance Company in India. If you are interested to start a micro finance business, then you might start with section 8 company. RBI approval is not required at all. No minimum funds of 2 cr. Can give loan for dwelling residence up to Rs.1.25 lakh. Section 8 company needs to comply with RBI guidelines on interest rate and processing charges. Further, it is a completely legal and you can even sue the defaulter. Let us see the difference between Micro finance through Section 8 company and NBFC. Can give an unsecured loan to small business, household woman etc. Rs.50,000 for small business and Rs.1.25 for setting up residence dwelling. Rs.50,000 initially and subsequently it can be Rs.1 lakh. We have defined the basic difference between the two different forms of business. Let is now proceed to the registration procedure of micro-finance company as section 8 company (Earlier section 8 company is also known as section 25 Company). Apply for DSC and DIN: This is the first step towards initiating the section 8 company registration. Apply for Name approval: This is the second step towards registering the section 8 company. The name end with the words like Sanstha, foundation etc. You can also use Micro Credit in the Company Name. Apply for Central Government License: After company’s name approval, the next step is to apply for Central government license. Under this stage, all other documents need to be prepared, even the income and expenditure account. Apply for incorporation: After Central government approval, the next step is to file for company incorporation. Under this stage, a company is formed. PAN and TAN: Now a day, the PAN and TAN is allotted once the company is formed. The physical copy of PAN card is sent via speed post at the registered office of the company. We have tried to resolve the big problem of a micro finance company. If you are planning to start a micro-finance company or you are already into it and want to conduct it legally. Click here to register section 8 company as a micro credit organisation. For more information, email to us at paras@hubco.in or agam@hubco.in.